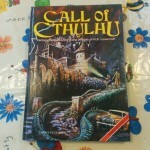 The comes a time in any Old School Renaissance blogger’s career when one fondly looks at Call of Cthulhu. 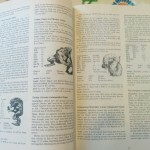 Especially relevant to me as a UK OSR blogger since back in the 80s it was one of the Big Four – D&D, Traveller, RuneQuest and Call of Cthulhu. 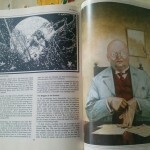 Those were the games that got regular coverage in White Dwarf, and I remember reading fantastic scenarios like the Watchers of Wablerswick. I first picked up CoC courtesy of Games Workshop, who did a very nice hardcover which like their version of Stormbringer collated both the contents of the 2nd Edition Box Set and the Keeper’s Companion. This meant that it was absolutely chock block full of content. The rules themselves only took up 100 pages, the rest was all scenarios (about five including my favourite The Secret of Castanegro) and supplementary material (such as the section about tying the Lovecraftian Mythos to Mesoamerican deities). I jumped right in playing it and that perhaps was my downfall. Inspired by author Sandy Petersen Keeper’s advice I created a series of scenarios which could at best be described as Old One in A Cave. 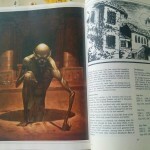 This style of play has the characters turn up in a remote town/village/abandoned house, find out something is a bit wrong very quickly from the creepy atmosphere, then ask questions of the locals (Fast talk roll), consult the local Libary (Libary Use roll) before heading off to confront the monster with or without the required banishing spell. My players at the time being 15 and used to solving problems with violence would either die or run away 🙂 It was a fun and atmospheric play style which unfortunately didn’t go the distance. In all fairness we discovered RuneQuest next, which suited this style of play down to the ground. Look Sandy Petersen had hair! 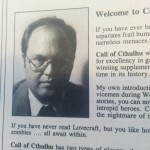 This entry was posted in Call of Cthulhu, Nostalgia by Newt. Bookmark the permalink.